If you want to buy cheap iceland shirt for 2018-19 season, buy it here in cheap-football.com , Check our exclusive range of iceland Football Shirts / Soccer Jerseys and Kits for adults and children at amazing prices. Get the cheap iceland jersey shirts, soccer kits with wholesale price, Free Shipping Worldwide! 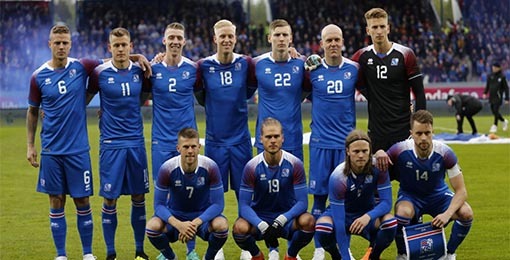 Iceland men's national football team represents Iceland in international football. The team is controlled by the Football Association of Iceland.The team has enjoyed success in the second half of the 2010s. In the qualifying rounds for the 2014 FIFA World Cup, Iceland reached the playoffs before losing to Croatia. Iceland reached its first major tournament, UEFA Euro 2016, after a qualification campaign which included home and away wins over the Netherlands. In doing so, they became the smallest ever nation to qualify for a major tournament. After advancing to the knockout stages of Euro 2016, Iceland defeated England in the Round of 16, advancing to the quarter-finals, where they lost to host nation France 5–2. They became the smallest nation by population to ever clinch a FIFA World Cup berth when they qualified for the 2018 tournament on 9 October 2017.